It's no secret that Chicago loves its ARRRchitecture and unique skyline. It's also no secret that people love pirates. Discover the architectural history that shaped this beautiful city on a tour of Chicago's shoreline. This optimal vantage point will give you an unforgettable perspective, as your guide takes you through the facts and unique stories behind some of the most famous buildings in the city. You'll learn about the people and plans behind these sites from a fun and comedic perspective. 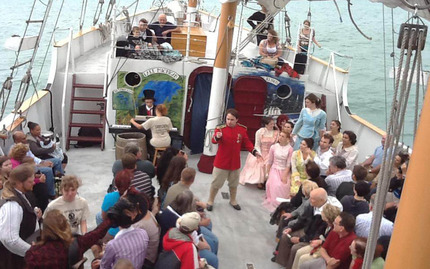 The best part is, you won't have to walk the plank at the end of this tour! Really relaxing to be on the water, and some fun pirate storytime with Zach. Thanks for a great time! Great staff! Very nice short cruise for a scenic view of our City!! 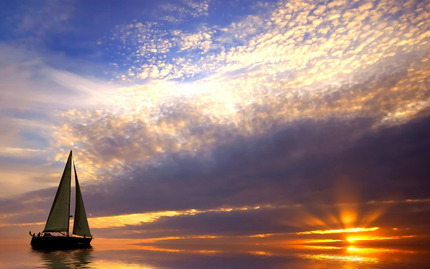 the sunset cruise was stunning, talented friendly staff, a very capable captain. we left the pier, raised the sails and had a delightful sail looking at the Chicago skyline, bartender was great he made mermaid drinks, that were a rum coconut pineapple concoction, extremely tasty. Just a wonderful adventure and very reasonably priced. Pirate Horns did an amazing job telling pirate stories with jokes for adults as well as the kids. He really made this experience memorable! Kids loved the ship, pulling the sails, and the beautiful Chicago scenery. A nice relaxing trip. This is a fun activity for any age. We did the pirate cruise but they offer other themed trips. You set sail from the docks at Navy Pier. You can get some beautiful pictures of the coastline while enjoying a tasty beverage on the water. Buy a drink/snack card at the ticket booth. You'll save a few dollars. You can help hoist the sails, listen to true pirate tales and if you ask nicely the captain will let you take the ships wheel for a quick pic. I suggest getting a seat on the foredeck (front) if possible and if you want a drink get it as soon as you get on otherwise you'll wait in line for a bit. It would have been nice if the pirate stories were told over the speakers instead of just on the main deck. Overall a great way to spend some time on the water away from the busy city. This is was a BLASTTTTT!!! Other story about the pirates in Chicago were much more interesting than expected. I learned a lot about the history. I would honestly do it again just because it was funny and informative. Great for kids and adults. They have a bar!!! Win!! This was a great tour. We took my grandfather for fathers day and he was just having a blast. I would suggest you buy a drink ticket in advance since you can save $2 that way and also the drinks are pretty fairly priced, usually I am used to paying $4 when I go to the zoo and want a gatorade, here on the boat it was only $2, which was great since it was a warm day. It was pretty cool to be on a sailboat and the tour provided some great information that I didn't even know about my own city! Kids would also love it! Was able to order 10 tickets without any issues. Aug 31st, was the last firework show of Navy Piers season. Was very excited they still had availability. Being a full working wooden ship we could feel the "chopy waters". We where invited to help raise the sails! Since they are interactive and a teaching vessel. Beautiful views, fun & funny crew. Very willing to work with us for pictures and making our experience fantastic! They are very reasonable priced tickets! Worth every penny! Rick was an amazing storyteller, glad we picked the Real Pirate cruise, probably the best experience I've had on Navy Pier, I felt like I actually learned something about the Great Lakes history. Tell your friends! 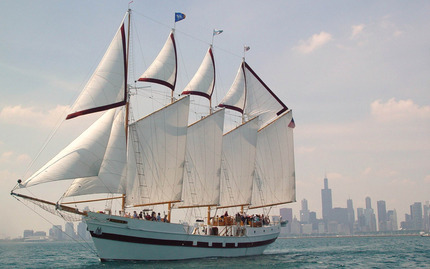 What a great program to be able to sail on a tall ship and experience the views of the Chicago skyline. I was fortunate enough to be onboard for the fireworks and I feel like we had the best seats in the house. There is a bar available with drink purchases and the entire crew is enthusiastic. The Captain is friendly and available for questions. Highly recommend. I just got back from my first trip ever to Chicago. I took my 17 year old daughter and while we did several fun things, The Tall Windy pirate ride with Pitate Rick was at the top. I was enthralled with each of his true pirate stories. I loved his passion for the stories and his delivery made it all so much fun. I'd like to start off my saying that tall ship windy is perfect for people with children. Not only does it offer the classic architecture tour, it also offers themed events. The name of the tour I went on was something like "real pirates". An employee dressed up like a pirate told stories on the main deck. People not interested on the stories were able to go onto one of the upper decks to relax. We sailed on the Windy today and had a fabulous time! The entire crew were amazing and really catered to the kids on the ship showing them sailing skills and allowing them to participate. The views of the city skyline were beautiful and the ship was clean and safe. I highly recommend this trip if you are visiting or a local! Took a Pirate cruise on the Tall ship Windy yesterday. We had a great time! Pirate Dave was very into his role and job. He was entertaining and also full of facts about life on the high seas of Lake Michigan. A bar was also on board,limited,but a nice perk and also a"head" if you needed that. The ship was smooth sailing and they even offered us blankets to ward off the lake chill. The crew was very gracious and friendly. They even gave us back our tickets to use at a later date for a half price cruise. It was a beautiful,sunny day and had great views of the city and the lake itself. I would recommend this tour to vacationers and Chicagoans like me! I took my 9 yr old niece on the pirate sailing. We both had a great time. The boat left on time and the Crew were professional and endured all had a great and safe time. They made sure all the children were included in the pirate takes and actually had the kids act out scenes. Great outing on a sailboat with beautiful Chicago views. Loved being on a tall ship. Even got to hoist the sails. It was a beautiful September day so there was plenty of wind. Loved seeing the city from the Lake. Tour guide was great but I'm glad I did the architectural boat tour first. It wasn't always easy to know which building was which. Went on the Friday night Pirate cruise. Being a local, wasn't expecting much at Navy Pier. Had a beer at Billy Goat instead of waiting in line. Was entertained by the stories of the Great Lakes pirates and a couple beers. A little chilly, but they provided blankets. Overall, a good way to start out the weekend!